Tackling a creative project is exciting and full of promise, but once we begin, the challenges and self-doubt we encounter can often derail the best of intentions. But once we identify Resistance, and recognize it as part of the creative process, we become more empowered to meet our creative goals. In December of 2014, the series finale of The Legend of Korra aired. After more than a decade spent breathing life into the Avatar universe, I decided to step away from my nearly twenty-year career in animation and transition onto a new creative path, one that was unfamiliar and uncertain: I planned to write my first novel. I already had the concept: art as magic. And I had ten years’ worth of notes, ideas, and character sketches to pull from. I planned to call on my own experience as an artist to tell a story in which a group of young artists would set off on a high-stakes adventure, confronting dangerous creatures and villains along the way. With my intention clear, I couldn’t wait to get started. I envisioned myself blissfully writing for hours, lost in this new fantastical world. Each morning, I fired up my computer, sipped my coffee, and sat down to write. But those blissful moments? They were elusive and impossible to sustain. Instead, I found my breath shortening, my heartbeat quickening, and my body tensing. Rather than joy, I was met with its opposite: anxiety (and its cousin, overwhelming self-doubt). Why did I ever leave animation? I asked myself. Who was I to think I could write a book? My writing is awful, I told myself over and over. No one is going to want to read this crap. I’d felt that unease before, but because I was trying something new, the anxiety stabbed more sharply and forcefully. After reading Steven Pressfield’s The War of Art, I learned this feeling has a name: Resistance. It is the embodiment of all our anxieties and self-doubts. It’s the voice that insists we’re not good enough or smart enough or creative enough. And that voice can be loud. At times, deafening. But when I put a name to Resistance, I found I could lessen its power. I couldn’t make it go away entirely, and as it turned out, I didn’t want to. Resistance became an essential part of my creative process. Identifying it helped illuminate what would become the theme of my book: How through creative acts, we have the power to transform ourselves and society. In the Renaissance-inspired world of Rebel Genius, we meet an aspiring artist named Giacomo, a 12-year-old orphan who lives in the sewers underneath the city of Virenzia. One night, after surviving a violent attack, Giacomo discovers that he has a Genius — a birdlike creature that acts as his protector and muse. At first, Giacomo is thrilled to have his own Genius, but immediately panic sets in. Because in Giacomo’s society, there is only one artist who is allowed to have a Genius — the empire’s leader, the authoritarian Supreme Creator. Giacomo is discovered by three other children who also have Geniuses and they bring him to a secret studio where he studies with an old, blind artist. Giacomo learns how to use his Genius to tap into the energy in the universe and manifest it into powerful, glowing shapes. He also discovers he has a unique ability to access a potent creative source called the Wellspring. In Rebel Genius, the Wellspring is the primordial ooze of creation and the source of all that we taste, smell, touch, see, and hear. When Giacomo accidentally opens it the first time, he is met with a maelstrom of foul odors, deafening booms, and freezing winds. Fearing its power, Giacomo steers clear of the Wellspring, though over the course of the book, he learns more about it and how to gain some control over it. Metaphorically, the Wellspring represents the creative process – a swirling cacophony of sound and color that an artist must learn to tame. 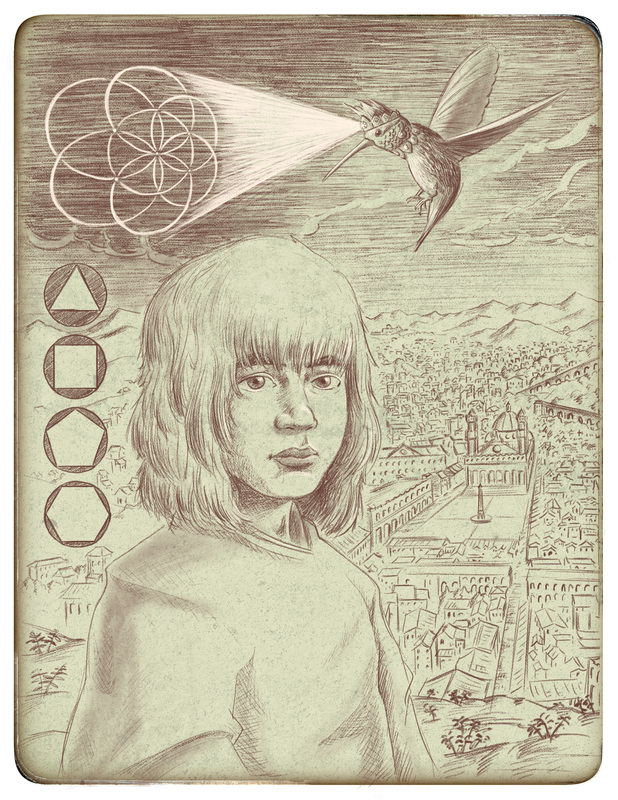 After realizing the scope of his talents, Giacomo has a unique insight into the location of the first of three Sacred Tools – powerful objects that have the potential to create or destroy. But when he is asked to go on this quest, Giacomo balks. He doesn’t think he’s ready. He’s inexperienced, unsure of himself, and full of anxiety. Living a creative life means we will inevitably have to embrace uncertainty. When we embark on a new creative project (or a new adventure, like Giacomo), it is because we have a burning desire to know something or to discover something about ourselves and the world we live in. But when we set out, we have only a vague idea where we are headed. We may have a destination in mind, but achieving that goal can often feel daunting and overwhelming. Maybe it’s safer to sit out the journey, we tell ourselves. And if we do muster up the courage to take those first steps on the creative path, you can be sure that Resistance will be lurking around every turn. It will try to frighten you away from your dreams. Giacomo faces vicious creatures and cunning villains on his adventure, which causes him to question himself and whether the goal he seeks is worth the cost. That’s his form of meeting Resistance. For me, Resistance appeared with each sentence and at the start of every chapter. Some days I was able to fight past the Resistance and write pages I was satisfied with. Other times, Resistance won and I had to regroup and come back to fight it again the next day. I realized there is no shortcut around the anxiety (believe me, I looked). Any time we forge into the unknown, it is impossible to predict what will happen, so there is bound to be fear. We have no idea if Resistance is going to trounce us, or we will subdue it. In order to continue creating, we have to trust that no matter how hard Resistance tries, it won’t prevail in the long run. Finishing the book and seeing the first printed copy of it was a proud moment. I felt like I had weathered Resistance and won, or at least survived. But the war isn’t over. Rebel Genius is the first book in a series and a few weeks after completing it, I settled in to tackle the sequel. And sure enough, my old nemesis, Resistance, was waiting for me once again. But this time, I’m more prepared for it. And even though my writing day is still fraught with self-doubt, I try not to let Resistance get the better of me. My intention is keep moving forwards on this new creative path. I’ll face Resistance whenever it appears and remind myself that the reason it’s there is because I’m venturing into new, creative territory. And that is exactly where I want to be. Back in May, I did an interview with Mashable about Rebel Genius. Here it is! Rebel Genius releases on Oct. 4. I’m thrilled to finally be able to announce what I’ve been working since Korra wrapped. I’m writing and illustrating a 3-book middle-grade series! The first book, Geniuses: The Creature and the Creator, will be published in Fall 2016 by Roaring Brook Press, an imprint of Macmillan Children’s. Set in a Renaissance-like fantasy world, Geniuses explores the concept of “art as magic,” where an artist’s creative genius is actually a living creature, a real-life muse that inspires and protects him or her. Because the leader of this world sees the Genius as a great and dangerous power, anyone with a Genius is captured, to ensure he or she doesn’t become a threat to society. Many have their Geniuses destroyed, and subsequently, become ghosts of their former selves, doomed to live a life without direction, inspiration, or original thought. But a talented few are keeping their creativity and their Geniuses alive at a secret studio, where young artists like 12-year-old Giacomo learn how to harness their Genius’ power. But before Giacomo’s training is complete, he and his fellow students set off on a life-or-death quest to find the mythical Creator’s Compass before it falls into the hands of a rogue artist, who plans to use the Compass to destroy the world. The journey of creating the world of Geniuses has been a long and meandering one that began over ten years ago. And it all started with a single idea: Art as magic. Little did I know these three little words would set me off on a quest to figure out how to tell an entertaining story that could express that concept. There were many false starts and wrong turns on the way to creating this book. More than once I gave up on it, abandoning what I had written to the recesses of my hard drive. But inevitably, a few months would pass and a new idea would spark my imagination, or a new angle on the story would present itself, and I’d dive back into the world. One of those important sparks was when I learned about the origins of the word genius. In a book about Da Vinci, I discovered that during the Middle Ages and the Renaissance, a genius wasn’t a person, but a spirit that protected and inspired artists. Ah ha! I thought, what if in my story, the artists had living muses? I immediately pictured them as winged bird creatures, rushed to my laptop, and continued to write. But while that idea provided a lot of momentum, I still floundered. I was also more than a little busy with Avatar: The Last Airbender and Legend of Korra, so any writing I did was either at night or on the weekends. In my mind, my story about artists and their Geniuses was a fun, personal side project that may or may not become publishable one day. Then in 2014, as Korra was winding down, I began to think about what I really wanted to work on next, and it wasn’t another animated show. I challenged myself to finish the “art as magic” story I began so many years ago and find a publisher who could help me get it out into the world. So I’m thrilled to be working with editor Connie Hsu and the team at Roaring Brook. The point of all this is to say that when I came up with this idea ten years ago, I didn’t think it would amount to anything, much less become a published book. But my Genius spirit prodded and inspired me to keep working on it, even when I thought the idea was worthless. I’m glad I listened to it and I hope the book inspires others to listen to their own creative muse, in whatever form that takes, and create what is meaningful to them. Over the years working on Avatar and Korra, I’ve heard from and met so many wonderful fans who have shared how the Avatar universe inspired them to overcome a struggle in their life, to follow a dream, or achieve a long sought-after goal. I realized how transformative and impactful stories and characters can be in a young person’s life, and I hope to continue inspiring and entertaining people with this new world. Art has been the driving force through my whole life and career. I was drawing as far back as I can remember, and probably before that. And although I’m now known for my work in animation, my early artistic heroes were painters like Picasso, Dali, and Pollock. In high school, as I became more serious about art, I hungered for stories about artists, but they were hard to come by. I read biographies of painters, but in the fictional realm, only The Fountainhead and My Name is Asher Lev provided stories in which the artist was the hero. My hope with the Geniuses series is to give kids the type of book my younger self would’ve loved growing up — a novel where artists are heroes, where creativity and inspiration can lead to a life-changing adventure, and where art is magic. Now that Korra and Asami’s final moment is out in the world, it seems like an appropriate time to express how I feel about it. I didn’t want to say anything right away so the audience could experience the finale for themselves. The main themes of the Avatar universe have always revolved around equality, justice, acceptance, tolerance, and balancing differing worldviews. In subtle and maybe not so subtle ways, Avatar and Legend of Korra have dealt with difficult subjects such as genocide, child abuse, deaths of loved ones, and post traumatic stress. I took it as a complement when Joanna Robinson of Vanity Fair called the show subversive. There were times even I was surprised we were able to delve into the really tough stuff on a children’s TV network. While the episodes were never designed to “make a statement”, Bryan and I always strove to treat the more difficult subject matter with the respect and gravity it deserved. And over the years we’ve heard from numerous fans, in person and online, how Avatar and Korra have influenced their lives for the better or helped them overcome a life struggle or setback. I am always humbled when people share their personal stories with us and I am grateful that my love for telling stories has been able to help people in some small way. So while Avatar and Korra were always meant to be entertaining and engaging tales, this universe and its characters also speak to the deeper humanity in all of us, regardless of age, gender, race, religion, culture, nationality, or sexual orientation. Our intention with the last scene was to make it as clear as possible that yes, Korra and Asami have romantic feelings for each other. The moment where they enter the spirit portal symbolizes their evolution from being friends to being a couple. Many news outlets, bloggers, and fans picked up on this and didn’t find it ambiguous. For the most part, it seems like the point of the scene was understood and additional commentary wasn’t really needed from Bryan or me. But in case people were still questioning what happened in the last scene, I wanted to make a clear verbal statement to complement the show’s visual one. I get that not everyone will be happy with the way that the show ended. Rarely does a series finale of any show satisfy that show’s fans, so I’ve been pleasantly surprised with the positive articles and posts I’ve seen about Korra’s finale. I’ve already read some heartwarming and incredible posts about how this moment means so much for the LGBT community. Once again, the incredible outpouring of support for the show humbles me. As Tenzin says, “Life is one big bumpy ride.” And if, by Korra and Asami being a couple, we are able to help smooth out that ride even a tiny bit for some people, I’m proud to do my part, however small it might be. Thanks for reading. Bryan and I were guests on the Nerdist Writer’s Panel podcast with Ben Blacker. We talked about the creation of the show, the move to digital, and even about the Movie That Shall Not Be Named. Ben does a great job with the podcast and has had some big names on in the past, like Matthew Weiner, Damon Lindelof, and Vince Gilligan, so I was honored to be one of his guests! It’s a great podcast, with in depth interviews with a lot of showrunners from some of the best series out there. A great resource for aspiring writers and people who just like learning more about how a TV show is made. Find the interview here on itunes. Also on the Nerdist website. In the final part of this series on “Beginnings, Part 1”, we’re going to take a look at the script — essentially the blueprint for all the actors and artists once we move into the production phase. Once the outline is written and we’ve received notes from Bryan and the network, I usually go over the notes with the writer before they head off to write the first draft. When I write a script, I also have all my other executive producer meetings to do, so often I’ll write for an hour here and there, sometimes at night, or whenever I have a spare moment. This isn’t my ideal way to write, but I make it work. Because we’ve thoroughly worked through all the story beats in the premise and outline phases, the script writing is more focused on nailing down dialogue and describing the action in a clear, visual way. I find it’s really helpful to have to only focus on those parts, without simultaneously trying to figure out the plot as well. It’s like if you tried to build a house while also drawing the blueprints at the same time — there would be a lot of wasted effort going back and forth between the two. One technique our writers Josh and Tim taught me is to take the outline and copy it into Final Draft (the scriptwriting program we use). Then you simply format the dialogue and action paragraphs and in no time at all, you have something that resembles a script. It’s much less daunting to start that way than with a blank page (and saves you from retyping things from the outline you may want to use). From there, I go through scene by scene, improving on and adding to the dialogue and action descriptions. One tip when writing action descriptions, especially for animation (though this would apply to live-action as well): because an artist needs to draw what is written on the page, the action descriptions must be a specific as possible. Good writing always conjures images in the readers imagination, but there is little room (or need) to get flowery in a screenplay, so I make sure to use action verbs and keep the language very concrete. Very rarely do I use adjectives, unless it’s important to the way a character will be animated. Otherwise, adjectives don’t add to the clarity of the description. Here’s an example from the script. Wan shoots wild blasts of fire at the Chous and the guards, but their numbers overwhelm him. Little Chou closes the gap and jumps on Wan’s back. Wan spins around with his arm extended, trying to hit Little Chou, but instead he creates a ring of fire around them. Little Chou falls off Wan’s back, pulling off Wan’s mask in the process. Wan raises his fist. Little Chou cowers and closes his eyes. There is one adjective in there — “wild” — to describe the way Wan is using fire. 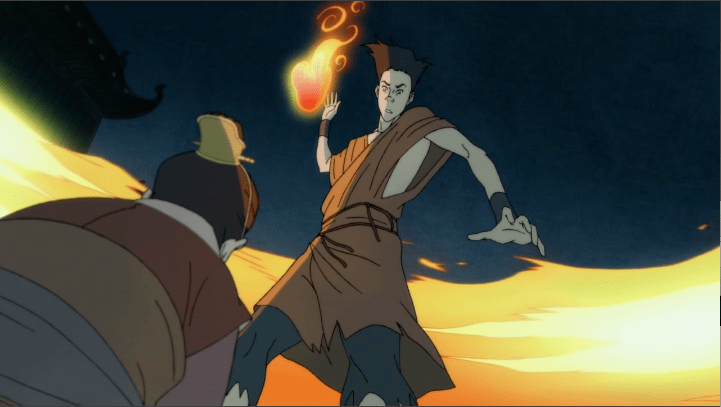 In this case I think it’s helpful for the storyboard artists to know how Wan is firebending. Since he’s still unskilled at this point, I went with “wild blasts”. After about three weeks, the writer turns in the first draft. Usually, it comes in a few pages long, which is fine at this point. We’d rather have more to work with than less. Before we turn it into the network for notes, we once again gather in the writer’s room and do an internal punch up session. As a group, we project the script on a screen, and go through it page by page. We pitch alternate versions of lines and try to make the dialogue as good as we can. We also trim out any lines or action that aren’t strong or critical to the plot, with the aim of getting the page count shorter. Once we are all happy with the rewrite, we then turn it into the network for notes. Once we get the notes back, we do one last punch up session (which is usually a lot quicker than the first), addressing anything that needs to be tweaked. We look for more cuts at this point as well. The goal is to finish with a 26-28 page script. Shows with a lot of action (like finale episodes) are usually even shorter, around 21 or 22 pages. We call this script the Record Draft, and this is the version we use to record the actors and which the storyboard artists use to begin visualizing the story. You’ll see numbers next to each dialogue line — these are used to keep track of each line as we record. Aye-Aye stands guard. Wan, (covered completely in mud, twigs, and leaves) walks up to the spirit. Aye-Aye looks suspicious. Sometimes animatics run long. Like really long. Like 25 or 26 minutes long. Those are always the toughest because we have to find a way to cut them down without compromising the story. Usually it’s a combination of cutting (or speeding up) some of the action and cutting dialogue. I’m always surprised just how much we can trim out without breaking the story. This episode came in at around 24 minutes, about a minute too long. We make these cuts in yet another group writing session and turn in the Animatic Draft, which the directors use to finalize the storyboards before sending the episode to Studio Mir. 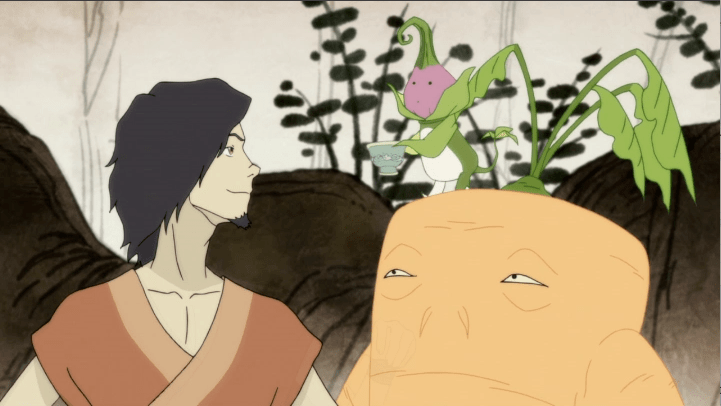 For this episode, the first sequence with Korra and the sage became shorter and shorter with each stage of the writing, until only the essential elements were left. Since this was Wan’s story, it made sense to get to him as quickly as possible. There’s also a scene on page 4 during the chase montage, where Wan is disguised as a woman. It was the least funny of the beats and I don’t miss it at all. It was a good cut. There’s also a short spirit wilds montage scene on page 15 that was cut out — again, it didn’t really add anything to the story, so we got rid of it. The Record draft is 28 pages, but the final version we sent to Studio Mir was 26 pages. And sometimes we have to trim out a little bit more when we edit the final episode. By breaking down the story into the premise, outline, and script phases, it makes the story writing process much more manageable. It’s similar to the animation process. You can’t start with the final, cleaned up animation. You begin with very rough storyboards and build from there. Likewise with the script. It just wouldn’t work to sit down with a blank script page and start writing some dialogue, hoping the story will gel in the process. Working through the premise and outline helps you as the writer figure out what the story will be. And if you want to make any big changes along the way, it’s much easier (and less demoralizing) to rewrite a few paragraphs of description than an entire script. *Due to Nickelodeon shortening our air times, the length of the shows decreased by a minute for Books 3 & 4. At first, I was concerned we wouldn’t be able to fit all the story we wanted into the shorter length, but it ended up working out fine.